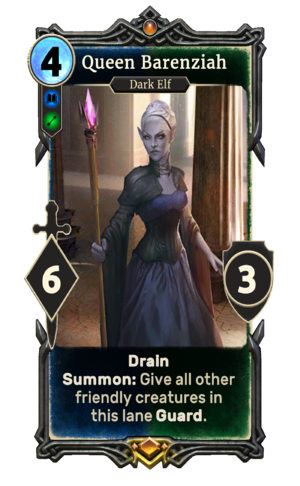 Queen Barenziah is a unique legendary Assassin creature card. It is part of the Core Set. "I am the queen mother. Attend me!" "Time to make more enemies." "You are full or surprises." This card's summon ability applies the Honor Guard card effect. Barenziah first appeared in Daggerfall, and later reappeared in Tribunal. For historical information about Barenziah, see the lore article. This page was last modified on 10 March 2019, at 11:09.